Mix the flour, salt and sugar in a bowl. Combine the apple wine and egg yolk, whisk into the flour, cover and leave to stand at room temperature for approx. 30 mins. Combine the lemon juice and sugar. Peel and core the pears, cut lengthwise into slices approx. 1 cm thick, mix with the lemon juice, cover and set aside. In a pan, whisk the milk with all the other ingredients up to and including the egg. Bring to the boil over a medium heat, stirring constantly. Remove the pan from the heat, whisk for a further 2 mins., pour into a bowl through a sieve, cover and leave to cool. Shortly before frying, beat the egg white with the salt until stiff, add the sugar, beat briefly then carefully fold the egg white into the batter. Heat the oil to 190°C. Dip the pears in the batter in batches, drain and deep-fry for approx. 1½ mins. on each side until golden brown. Remove with a slotted spoon and drain on paper towels. 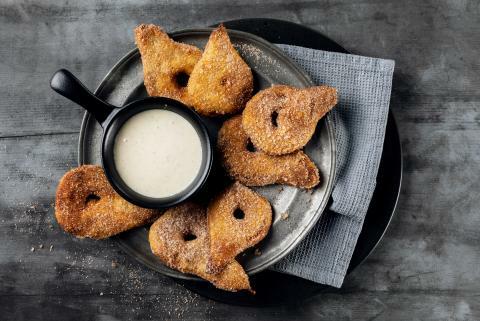 Mix the sugar and cinnamon in a dish, dip the pear fritters in the sugary mixture and serve immediately. Instead of apple wine, use beer or pear juice.